BisMan Community Food Co-op launched its Member Loan Campaign Wednesday as part of its plan to start a member-owned grocery store. The campaign consists of current members pledging a loan to the co-op, so additional financing can be secured from a bank or credit union. The co-op was launched in the summer in 2013 and now includes about 650 members. The BisMan Community Food Co-op is designed to support local food, fair wages and educating the community on making healthy choices. The grocery store is scheduled to open in 2015, depending on whether the co-op has to renovate a building or build one. The co-op’s goal is to raise $500,000 by Nov. 15, and they hope to secure about $500,000 from a bank after the campaign. “We've exceeded our goal to have 10 percent of our overall goal committed before launching the capital campaign and have $75,000 committed by members that have been core supporters since the beginning,” Heidi Demars, outreach coordinator of the BisMan Community Food Co-op, said. The co-op also plans to approach local businesses about buying preferred equity, a type of stock. 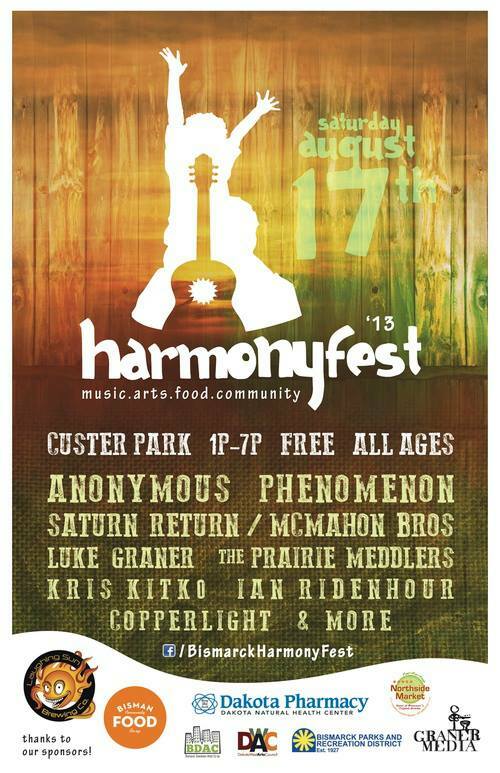 Reach reporter Karee Magee at 701-250-8251 or karee.magee@bismarcktribune.com. The past couple of months have been focused on our member loan campaign. Very few start-up co-op's like us launch a member loan campaign without a site. Having said that, our board felt is was important to move forward and try to raise the capital needed without a delay in our development. We reached about half of our goal and have shifted our focus to selecting a site. Anyone who lives in the area knows that the market in Bismarck-Mandan has been impacted by fast-paced growth due to the influx of oil development in western ND. This has driven up the cost of retail spaces and has forced us to work quickly when we find a site that we think might fit our needs. Membership has slowed a bit but our focus is to continue to build the number of member-owners while educating our existing members on the importance of principle #3, member economic participation. This means our current members have an opportunity to invest further in their co-op by providing a member loan or purchasing preferred equity. Having our member-owners contribute to the capital of their co-op is a cornerstone in food co-op financing. We have managed to meet half of our goal but know that once we can announce a site we will have more members interested in investing. We are grateful to all our members who have supported us and we are looking forward to 2015! Our next steps are to locate a site, sign a lease, advertise for our General Manager, and begin working on renovation of our store. Good things ahead! We have remained steady with our membership growth and are actively seeking a site. Onward and upward! We are starting something new here at the co-op. It's Q&A Tuesday! We get all sorts of questions via email and we'd like to start sharing them. Please feel free to send us a message or post on our wall. We love hearing from our members and future members! Brianna asks "I visited Amazing Grains in Grand Forks this weekened. Will the BisMan Community Food Coop be similar in size, prices and variety of offerings?" Amazing Grains is quite a bit smaller. Our co-op will be between 6,000-8,000 square feet so about 5 times that size. We will have bigger sections and because we will have more retail space, we will carry more products. We also have plans for a deli with a juice/coffee bar with more grab-and-go items. As far as price goes, we will be competitive to current prices in Bismarck. For example, Almond milk in Grand Forks is around $3.49, in Bismarck it's closer to $4.89. This is because we are in service gap in terms of proximity to a major distribution point (Minneapolis, Billings) These are all issues that we have been addressing over the past 2 years and will continue to work on collaboratively with our GM when that individual is hired in early 2015. Amazing Grains is a great little co-op but they are growing and talking about expanding to serve their 1300+ members better. Fyi: all co-op meetings are open to members so if you're interested, go to our website and click on our calendar of events to find our next meeting date. Next steps on the road to opening the co-op! What is Member Economic Participation and what does it have to do with me? Cooperative businesses embody 7 cooperative principles to guide their organization. 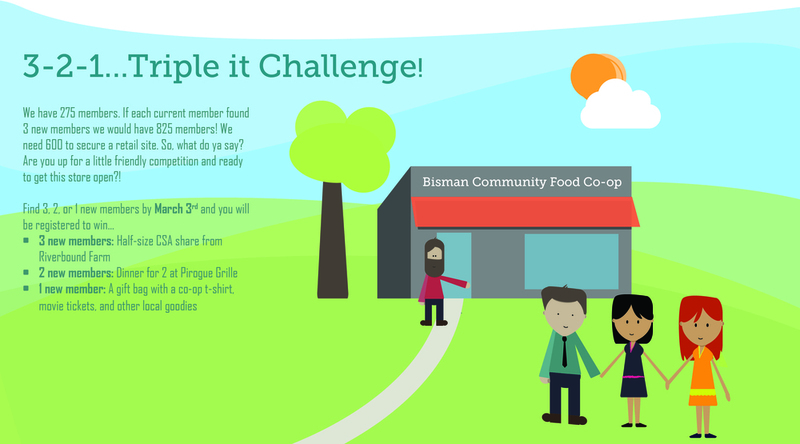 Co-op principle #3: Member Economic Participation means that YOU are an owner of the co-op and are vital to the start up capital of the BisMan Community Food Co-op. The funding structure for start-up co-op's include member shares, member loans, and a commercial loan. Right now we have begun the pre-planning for our member loan campaign. Why member loans? 2) Make an additional investment either as additional non-voting equity or as a member loan. So what's next? We are need 600 members to secure our site and will continue to build our membership even after we've secured our site. Ultimately, we want to open our doors with 1,000 members. We will be sending out a letter to all members later this summer once we finalize the terms of the member loan program. In the meantime, keep spreading the word about the co-op! Were you ever that annoying kid on a road trip asking "are we there yet" relentlessly from the backseat of your parents station wagon? I know I was. My husband and I recently drove cross-country from Arizona to North Dakota with our 2 children and had to answer this very difficult question ourselves. If you say yes, the anticipation builds and they suddenly think the "Welcome to North Dakota" sign will appear momentarily. If you say no, the whining ensues and you are left with 2 grumpy children in a really messy mini-van in the middle of Wyoming. Organizing a start-up food co-op can feel much like a long road trip, except that we have patient, understanding members and no one is throwing shoes at the back of my head (at least not yet). We are working to make this journey fun and while we are excited to get there too, we know we need to follow a road map to get to our destination. As you know, we are following a co-op development model that has proven to be successful for others start-up's just like us. We have 500 members as of May 5th (yipee!) and are working with a site selection committee and commercial real estate agents to find an appropriate site. Does this mean when member #600 joins we will have a site? In a perfect world, yes. But we are at the mercy of the market here in Bismarck and are looking for an ideal location that has all the elements that we want for our community food co-op. We'd like to be centrally located, on or near the bus route, and we are striving to be a bikeable/walkable destination. We are also working with a talented graphic artist who is creating an info graphic that will illustrate our timeline and next steps so our members have a better idea of the process we're following. So hang in there, Bismarck-Mandan! We are inching closer to our destination with each new member. In the meantime, we have several fun events planned for this summer and appreciate your continued support. Be sure to check our calendar of events periodically. Members are also encouraged to host a house party (can you say fun?) to help grow this movement. Please tell your friends, family and co-workers about the food co-op. And, most importantly, don't forget to enjoy the ride! The BisMan Community Food Co-op met with representatives from Basin Electric recently to discuss our current membership needs and to learn how we could support each other as cooperatives. We currently have 350 members and need 600 to secure a retail site for our store. As a start-up food cooperative in its early stages, our board of directors, members, and volunteers are standing where other cooperative pioneers in ND stood before us many years ago. In the late 1930s and early 1940s, most rural people in North Dakota lived without electricity. Power companies were convinced that they couldn't make any money by serving the rural countryside, so they declined to run power lines out to the country. All across the country, including in North Dakota, rural people were banding together to help themselves by forming electric cooperatives. By working together in cooperation, rural electric cooperatives helped light the countryside. They demonstrated that they could have their needs met by working together for a common goal. So like other cooperators did year ago, we are banding together to achieve an outcome. We want access to healthier, fresher, local food and to support farmers who grow food in our region and make North Dakota their home. We want to be part of a strong local economy and to empower members to know where their food comes from. We want to support a democratically controlled business that is governed by its member-owners. We want to be an anchor business in the Bismarck-Mandan community for generations to come and we want you to invest in this co-op with us. Membership is a one-time investment of $200 and Basin Electric has agreed to contribute $50 toward every membership purchased by one of their employees. That means a Basin employees could invest as a member-owner of the BisMan Community Co-op for $150 and Basin will contribute the rest. How great is that? Talk about cooperation! Thanks to Baisn Electric for helping us build a healthier Bismarck-Mandan. Many people made this event possible and we are continually amazed by the support from the community. 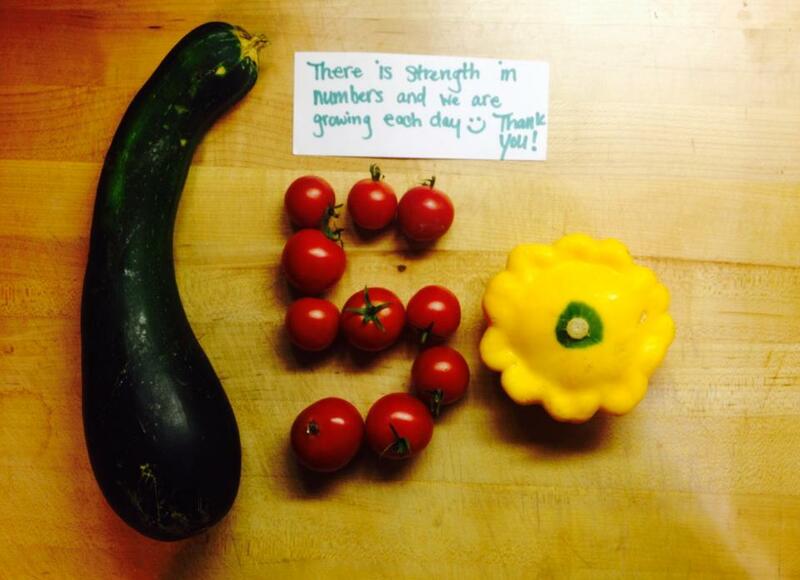 At the heart of all of our efforts is to make a food co-op a reality in our community. This goal is shared by many and each successful event like this takes cooperation, time, and energy on the part of those who want to get involved. And that is the beauty of a start-up cooperative like ours, it belongs to everyone who wants to be involved. This is principle #1 from the 7 cooperatives principles that we embody with our work. Principle #1 states that cooperative organizations must have an open and voluntary membership. According to the ICA's Statement on the Co-operative Identity, "Cooperatives are voluntary organizations, open to all persons able to use their services and willing to accept the responsibilities of membership, without gender, social, racial, political or religious discrimination." So, what are you waiting for? We've heard from a few people that they are waiting to sign up for membership until the store opens. Well, if there are enough people out there with that same mentality, the co-op might not open! We need you, the founding members to help plant the seeds for this community-owned food cooperative to thrive. So, don't hesitate, cooperate! Spring is just around the corner and we have several volunteer opportunities approaching! We are using VolunteerSpot to coordinate or sign-up efforts. Please check out our upcoming events and let us know if you are able to help. All volunteers will receive a free t-shirt! The Triple It Challenge! 3,2,1....Go! Members! This is your call to action! We currently have 275 member-owners. We need 600 to secure a retail site. If each current member found 3 new members we would have 825 members!! We know you want to see a co-op in the community as much as we do, so we're asking for some help on this. We need YOU to tell your friends, family, and co-workers about us. Get them to become a member and you'll be handsomely rewarded if we draw your name. So, here's the deal: We are giving all current members until March 3rd to help recruit 3, 2, or 1 new members. Recruit 3 new members: A small share from Riverbound Farm CSA (retail value of $600). This means fresh, organic produce for the entire summer and into the fall. Recruit 1 new members: A gift bag with a co-op t-shirt, movie tickets, and other local goodies. So what are you waiting for? Let's work together in cooperation to get this store open! Check out the homegrown ad we created for community access channel 12! Thanks to help from Jim at Dakota Media Access, we were able to use footage of local food from area farmers and local music from the Prairie Meddlers and Jim McMahon. When will the co-op open? You decide! The model is based upon the four cornerstones of vision, talent, capital, and systems that are each within three stages of food co-op development: organizing, feasibility and planning, and implementation. The four cornerstones comprise the attributes of a successful start-up within the three stages. We are currently in stage 2. Until November of 2013, our efforts were entirely volunteer-driven. This was maintained by several hours of sweat equity poured out by our board of directors and volunteers. We now have a part-time Outreach Coordinator (yours truly) to handle membership, PR, and planning. We've also got an amazing, rock-star group of people devoting their time and talents to marketing, finance, site selection, and communication. You see, we can't do this alone and that is why we are so passionate about creating a COOPERATIVE instead of a single-owner natural foods market. At the co-op we work together to get things done. And yes, sometimes it may take longer. But we're not going anywhere and we all think its worth it. We are creating a flagship business whose model and values are rooted in sustainability, fair trade, social responsibility, equality, and honesty. Values we feel are desperately needed in the marketplace. With that said, we would love to be able to give you an opening date, but a co-op is a different kind of animal. We will work our buns off to organize, promote, build, partner, and develop the co-op the best that we can, but it really comes down to you. So, if you ask "when will the co-op open?" I will ask you in return, "are you a member yet?" We can build this together with cooperation and community. One step toward making healthier choices is to create rituals around healthier food choices, and for the Demars that meant growing a garden in the back yard, and having the children in the family help with cooking and taking turns being "chef of the day." As consumers, Demars said the biggest question is how we can be more mindful of where our food is coming from and the people that produce it. This also means considering the long term consequences that might occur to our current food system. The co-op already exists in our community. I had the opportunity to attend a 2-day retreat with our board of directors last weekend. We had an in-depth discussion on the cooperative principles that guide us, board decision making, and strategic planning. It was also a time for us to learn from someone who has been through this process before. We welcomed Ben, a co-op consultant from Harrisonburg, VA, to our cold and snowy community. Ben was was an integral part of opening Friendly City Food Co-op, a start-up that opened its doors last year after about 5 years of planning, organizing, and building membership. The process we are following is very similar to theirs, although each community is different in terms of its timeline. We were happy to have Ben join us and share his expertise on the start-up process. He helped us to realize we are not alone in our efforts, and that the process can be long, but its worth it. He assured us that we are right on track and was excited to hear about our progress. So whatever drives us and inspires us to continue to work through this process, we want you to be a part of it, too. In fact, you already are! Below is an image that Ben shared during the retreat. Its a simple, yet powerful illustration that demonstrates that the co-op already exists in our community. We will eventually have a store, but all of the outreach events, house parties, education/marketing, cooperation, and in-kind contributions made by many, many people is exactly what the co-op stands for. When kids get to make food art while their parents watch films and participate in discussions, the co-op already exists. When someone decides to host a house party and spread the word about what we are trying to do, the co-op already exists. When someone decides to become a member-owner or volunteer their time, the co-op already exists. When we partner with other business or producers to promote local, sustainable farming, the co-op already exists. So although we have some work to do before our store is open, we are already there in many ways. The movement to open a food co-op is afoot in Bismarck-Mandan, and it is alive and well! The BisMan Community Food Co-op is hiring an Outreach Coordinator! This position is being funded through a Marketing & Utilization grant from the North Dakota Department of Commerce Agricultural Products Utilization Commission. The BisMan Food Co-op Board of Directors is grateful for their support.